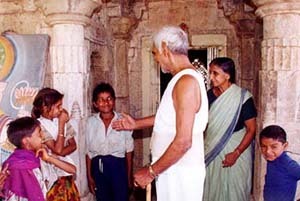 Baba Amte is a legend in a self-centred nation. With Charity Destroys, Work Builds as his talisman, he has given dignity to thousands of Indians afflicted by leprosy, brought hope against exploitation to many thousands of tribals and provided a way of life to thousands abandoned by an uncaring society. 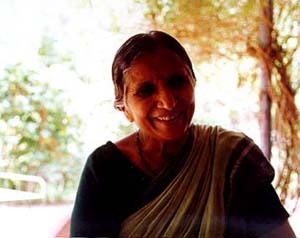 Archana Masih and photographer Jewella C Miranda travelled to Kasrawad on the banks of the Narmada in western Madhya Pradesh to find out what fifty years of freedom mean to the extraordinary crusader. Baba Amte is accustomed to delayed letters and uncalled visitors. Guests precede their letters of arrival and the solitary telephone at the foot of Baba's bed doesn't work through the day. But Nijibal, his ashram, doesn't turn visitors away. A small patch of verdant green at the edge of a tribal village in Kasrawad, Madhya Pradesh, Nijibal or inner strength, overlooks the Narmada river and has been Baba Amte's home for seven years. 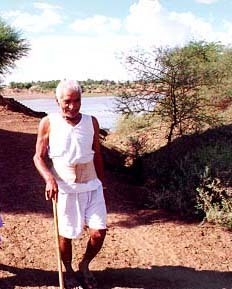 Till a few years back, he would go down for a walk to the Narmada. But the likelihood of a fall on the muddy incline to the river has restricted his walks to the 200-year-old temple on the western side and a narrow dusty path towards the village on the other side. "I chose to live here because this is the most threatened region in the submergence zone after the dam is built," explains the 83-year-old crusader. The map beside his bed indicates that the Sardar Sarovar dam is 200 kilometres away and it is his protest against the construction of such big dams that brought him here. He has vowed not to move from Nijibal until the government heeds his protest. "I am not committing suicide. If the river comes to take me, why should I move?" Two years back, the river nearly did that: Baba Amte and his wife were forcefully evacuated by the police in a canoe and confined to the Barwani circuit house for two days. Since then he has scarcely stepped out of the ashram and has continued his struggle for the welfare of thousands of tribals from his bedside. For more than half-a-century, Murlidhar Devidas Amte has fought for forgotten causes, given voice to the voiceless, and brought hope to those abandoned by society. Lepers eaten by maggots, tribals alien to civilisation, orphans dying of malnutrition , the uncared for aged, the neglected handicapped... he's taken them all and given them a way of life in a singular message: 'Charity destroys, work builds.' The motto on which was built Anandwan, the sprawling home for leprosy patients near Chandrapur in Maharashtra. "Compassion has no utopia, party or ideology," says Baba Amte whose humanitarian work have won him scores of awards. The Padma Shri, 1971; the Rashtra Bhushan, 1978; the Damien Dutton International Award, 1983; the Padma Vibhushan,1986; the Magsaysay Award, 1988... He doesn't count them anymore, neither can he accept them in person anymore. 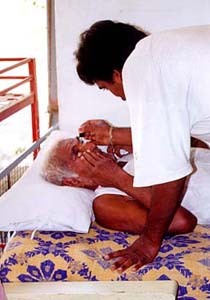 A severe case of cervical spondilytis has virtually left Baba Amte immobile. His spine cannot withstand the pressure of a sitting posture, restricting him to a standing or prostrate position. A brace supports his damaged spine and meals are eaten with one foot balanced on a chair. In a complicated operation at Wimbledon in 1971 two of his vertebrae were replaced by that of an anonymous animal, the scar of which can scarcely be concealed by his wrinkled neck. "I was tempted by Shankar bhagwan. He too has spondilytis but uses a cobra as a brace." He humours his physical inhibitions, but confesses his inability to do as much as he would like to because of poor health. "I have to be cautious, but caution also has its own adventure." And it is this caution that compels him to consume 19 tablets, eye drops in his cataract-inflicted eyes and a concoction of turmeric and herbs each day. Before plunging into his crusade against leprosy, Baba Amte was a practising lawyer. He organised lawyers to take up the defence of the imprisoned leaders of the Quit India Movement in 1942 and was imprisoned for his attempts. Often referred to as the last follower of Gandhi, Baba believes there was no alternative to the Mahatma. "Gandhiji's whole life was sterilised by truth," he says, "He established a permanent relationship with the common man with a thread and spinning wheel. He could start a mass movement with a pinch of salt." Though deeply influenced by Gandhi, with whom he had spent some time at the Sevagram Ashram, Baba Amte says, "All isms are lying on their deathbeds including Gandhism." Then, lifting his head from his khadi-cased pillow, he stresses, "But Gandhi will be more relevant in the 21st century. I am hopeful that the neo-Gandhis will bring this change." In a nation which has slipped out of Gandhism's clasp, Baba Amte has rigidly held firm to the Mahatma's ideals. Be it his belief in village industry, empowerment of the people, upliftment of the poor or a spartan way of life. He wears khadi woven from the looms of the Anandwan rehabilitation centre, eats fruits and vegetables cultivated in the ashram and lives a quiet life. His day begins at 4:30 am with a walk to the temple with Sadhanatai, his wife of 51 years. "It is for the first time after so many years that Baba comes to the temple and rings the bell for me," says Sadhanatai. A non believer in idol worship, Baba Amte's logic is that ''it makes her happy.'' He rarely misses an opportunity in acknowledging her contribution to his work. "My work is my life, my life is my work, but Sadhana is a part of both," he says. With lunch at 10 am and supper at 7 pm, the day is largely spent listening to letters read by Sadhanatai, talking to visitors and indulging in some friendly chat with a bunch of tribal kids in the afternoon. Each child, often unclothed, makes the daily excursion for that solitary sweet promised in return for a bath in the river. It is the plight of the deprived tribals that distresses him the most. "The condition of the tribals is worse than those inflicted with leprosy," he says, "Purna swaraj can only be possible when the poorest of the poor is uplifted." According to him, a balanced economic system is one which provides ''Sufficiency for all and superfluity for some.'' "The MNCs have entered the country like nomads. The majority doesn't need Pepsi or Coke, they want water. You can have your skyscrapers and Cokes but before this you must ensure that that tribal girl defecating in the open has the privacy of a toilet." His tone is mellow, but the message powerful enough to jolt urban anaesthesia. 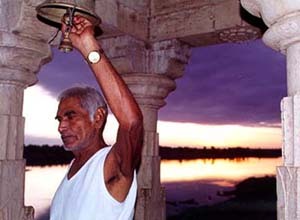 In his unique and courageous journey, Baba Amte has always had a hard hitting impact. His wife forsake a comfortable life and faced near social ostracism for assisting him in caring for lepers. His sons, Vikas and Prakash, are medical doctors and have followed his footsteps. Vikas looks after Anandwan and Prakash works for the welfare of the Madia and Gond tribes in Hemalkasa, 350 kilometres south of Nagpur. "In our family, Baba is the speaker; Vikas the amplifier; Prakash, the silencer; Sadhana the brake," jests Sadhanatai. Last year, her grandson, also a medical student, took a pledge before Baba Amte and the Narmada to continue this legacy further. "In the Amte family, there is no scope for a Amte virudh Amte," he laughs, referring to the popular drama currently playing in Bombay, Gandhi virudh Gandhi, which revolves around the conflict between the Mahatma and Harilal, his eldest son. For a man who once speeded in fancy cars, wrote film reviews for The Picture Goer, corresponded with Hollywood icons Greta Garbo and Norma Shearer, Baba Amte has come a long, long way since that rainy night in Warora. The sight of Tulshiram, a maggot-eaten leper, changed his life forever and Baba Amte was on course to fulfilling his destiny. He tended to those shunned by society and started Anandwan in 1949 on 50 acres of barren land, six leprosy patients, Rs 14 and a lame cow. Today, Anandwan is a self-sufficient sprawling rehabilitation centre with over 3,000 inmates. Funded largely by donations, the first of which came from Norma Shearer, it has its own university, hospital, orphanage, technical units, dairy and farmlands. In 1974, Prakash and 16 cured leprosy patients launched the 'People's Brotherhood' at Hemalkasa. "When they first went there, the tribals didn't even know how to wear clothes and eat properly," says Sadhnatai. Hemalkasa now has a hospital and three of its tribal children are studying medicine in Bombay. Baba's adopted daughter and her husband also work there. "It is a very remote place -- the news of his son's birth in Nagpur reached Prakash a month later because of the rains," says Sadhanatai, showing us pictures of Hemalkasa and Prakash's adopted daughter Arti. On the verandah's walls are framed pictures of Prakash playing with lions and Moroccan stamps commemorating his work. 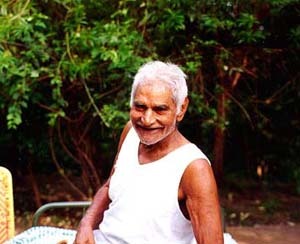 Baba Amte's face softens into frequent smiles and occasional laughter. Yet it is difficult to conceal aspirations that have run asunder. For a man who devoted his life to ignored social causes, Baba Amte is a disillusioned man today. He feels that the tradition of democracy in India is on a decline, if not already dead. "This is not true democracy, but a dominant democracy. Here a political party gets money from outside to conduct internal elections. Politicians give scope for corruption. Slum lords run parallel governments. One landslide in Assam and rice is sold at Rs 50 a kilo. The North-East is occupied by troops, so is Kashmir. Black money is more powerful than the Reserve Bank. Gandhiji did not want this. After 50 years what democracy is this?" he asks. His hopelessness at the state of the country is so pronounced that his face crumbles in agony when asked to speak about it. "I don't feel enthused about the 50 years of Independence. I was asked to be part of a committee set up by the government but I declined... When borders are becoming invisible, we are talking about regional parties dependent on the Centre. These regional parties have become shapeless pygmies. This is an era which needs sharing and understanding for humanism," he says vehemently. "Our governance is by a gerontocracy. This cataract of history can only be removed by youth. In this common man's century, only the common man can change the profile of this country." He draws an analogy between Indian politicians and his leprosy patients: "When leprosy patients touched the soil, they transformed it into gold, but the politicians did that and made it into dirt." The politicians of today are an aberration to those he admired -- Gandhi, C R Das, Govind Ballabh Pant, Thakkar Bapa, Tilak and Nehru who "looked left and walked right." "Netaji was patriotic, but his method wasn't correct. If he had come out and said Jai Hind even once, Nehru wouldn't be there," he continues. These reminiscences come in snatches, but the sense of disappointment persists... whether it is the Congress or Atal Bihari Vajpayee -- "I had great hopes of Vajpayee, but I was greatly disappointed by his conduct after the Babri Masjid demolition. He cried, but those tears were crocodile tears" -- , rath yatras or isolated political aspirations. "Those who indulge in history cannot create new history. You cannot legislate national integration unless political work is done constructively and there is a lifestyle for life." The existing vacuum, the lack of initiative to improve humanity and the quest for recognition by power-hungry politicians has put him in extreme discomfort. "Those who do monumental work don't need monuments," he says. The fact that fifty years after Independence, India still carries prejudices against caste and religion is for him a symbol of lost aspirations. Yet, his trust in India's youth gives him hope, "This is a transition period, after which things will look up," he says. Occasionally, he raises his head slightly for gulps of water and wards off the stray ants crawling on his arms. On the verandah, is a box of grain for the sparrows and squirrels of Nijibal. Surrounding him is his luxurious garden. "We are the trespassers here," he looks into the huge banyan tree above and breathes deeply. "Kinship with nature and animals makes men hypersensitive." Driven by this sensitivity, Baba Amte scarcely gives thought to the menace of the monsoons. The river could again draw in to swallow Nijibal, but he is not worried. "Search itself is my destination and work, my chloroform. If there are any anxieties, I flush them away though I have no flush latrine myself." He cites a Chinese proverb with a similar message and goes into the first few lines from Rabindranath Tagore's Where the mind is without fear... a poem which perhaps most aptly describes his work and life. In his long journey Baba Amte has never known fear. There was a time when he allowed bacilli from a leprosy patient to be injected into him for further tests; today he breathes via a pace-maker. Yet his spirit is rock-like. In his fight for the ignored and the marginalised, his is a heroic and legendary endeavour. And to thousands of tribals, in his white khadivest, shorts and a walking stick -- he remains the solitary symbol of hope beside a quietly murmuring Narmada.